This might bit a bit irrelevant but will like to know what is the Montessori way of teaching toddler to sit throughout meal time. He will play with his food after he is about half full and will either ask me to feed him the rest or he will just go running around. Two things: when he begins walking around, and or plays with his food, mealtime is over! Period. Your toddler will cry, scream, throw a tantrum, say he isn't finished, but he is, he just doesn't realize it. It is actually a learned skill, their bodies know they are finished, but not their brains, so to speak. To avoid this situation, give your toddler less food or smaller portions (we were always asking parents at our school to send less food!). Preschoolers eat like birds! They become more interested in being social! But the Montessori aspect of mealtime is showing the toddler how to put his food away and clean up--and he is in the sensitive period for this! Now this will take a lot of time! Be patient! And again, your older child will be the role model! Let's say it is lunch, your toddler is running around, and you say "Lunch is over!" And he comes running to you crying! You ask him to help you! "It's time to clean up!" (Say it with a smile!) But prepare your environment, first the week before, and show your older child what you are doing and why! Have a place for your children to bring their plates, cups, napkins, etc., as well as a sponge and little whisk broom and a trash bin and a recycling bin. You can use paper plates for throwing in the trash, or plastic plates for putting in the sink, allow your children to carry their plates, as well as access to the garbage and recycling bins, then they can go back and get their cups and place in the sink, or on the counter (and you will need a stepping stool so they can reach the counter). Then they can get their napkins and put those away. Lastly, they need to be shown how to clean up crumbs and spills with a sponge, towel, whisk broom. Your four year old should do well enough so that you can help your toddler for the next three to six months, one-on-one. It often helps sing a little song while you clean up! 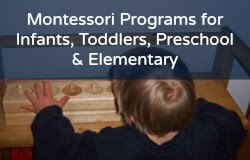 My affordable online Montessori programs and PDFs for birth to age nine (including "Must Haves for Toddlers," and a "Daily Schedule"). Need quality Montessori materials? Shop at my favorite Montessori seller (and my affiliate), Montessori Services! They are a locally-owned company--in my county! More of my Montessori blog posts on toddlers?